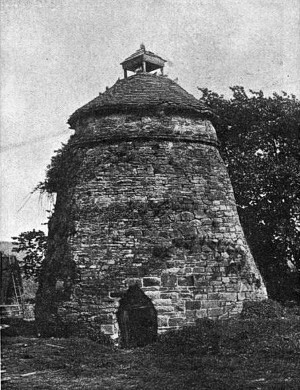 For hundreds of years the dovecote stood in the grounds of castle farm. Some historians initially believed the dovecote to date to the 17th century, suggesting that like the farmhouse it had been built from stone taken from the ruins of the castle. However it is now believed that the dovecote was built much earlier and was a 14th or 15th century addition to the castle. Pigeons provided eggs and meat for the medieval diet, but because they ate the crops, only the lord of the manor was allowed to keep them. 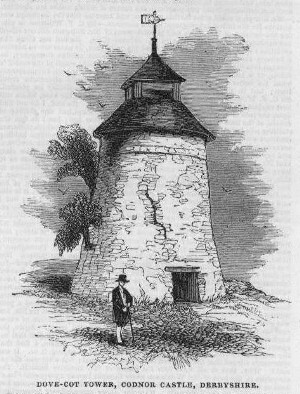 A dovecote was also a sign of wealth. 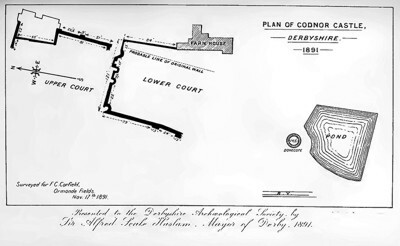 Fig.1 Location of the dovecote in relation to the castle and farm buildings. The building was conical in shape and rose to a height of about 22 feet, being capped with a slated roof and wooden lantern to allow access for the birds. Its walls were made of quarried sandstone like the castle, and were approximately 5ft thick at the base. It was constructed using a lime mortar that contained particles of charcoal, a technique that was common with Norman builders. The interior was different in that a soil mortar was used between the stones. Inside were twenty rows of nesting holes built in to the wall, approximately 400 in total, each with a stone ledge for the birds to land on. A small 3ft 6in door in the north side allowed access to the interior, which was lit by one small window in the south side. walls of the castle devoted to military purposes, and thus lose an instructive opportunity of making himself acquainted with an interesting feature of the private, every-day life of the early founders and inhabitants of this place. Many thanks to www.jacksdale.org.uk for the above article. The dovecote was restored and re-roofed in 1904 and a stone built into the rear of the building had the letters REP testifying to this. Fig.3 The Dovecote a few years after its restoration. Photograph taken approx 1910. An iron ladder existed inside when the above photograph was taken, but this may have replaced an earlier wooden ladder. Dovecote belonging to Richard Henry Holmes, at Codnor Park, for an unlawful purpose on Sept 22nd. to come from the Dovecote, where he kept about 40 pigeons. He immediately went for a constable. wooden door and a window about 12ft from the ground. dropped in through the window and had injured his wrist. wooden fence, which defendant had to negotiate before getting to the Dovecote. in the wall, and must have overbalanced and fell in. Supt. Walker: You didn’t expect to have such a drop: - No. 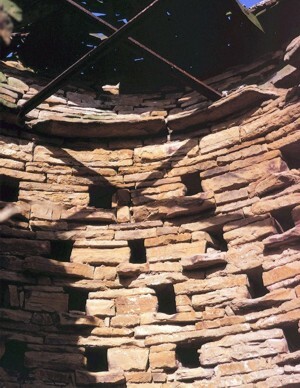 Fig.4 The interior of the Dovecote showing some of the 400 nesting holes. Photographed in the 1960s by George Eyre. Displayed courtesy of the George Eyre Collection. By the mid 1960s the Dovecote had again fallen into disrepair and many thought the building should be demolished. should be taken regarding the dovecote, but the castle ruin should be preserved. and one of the few of its kind remaining in the country. informed that the council wish the castle ruins to be preserved. adjoining was built from the stone of the ruined castle. 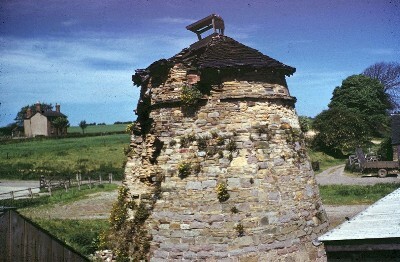 Later in 1968 the dovecote was severely damaged by a farm tractor and in 1969 the decision was made to demolish the building. With the recent demolition of the dovecote at Codnor Castle, a controversial link with the past has vanished for all time. Billy Belfield, nobody seemed interested with this unique link with past history. 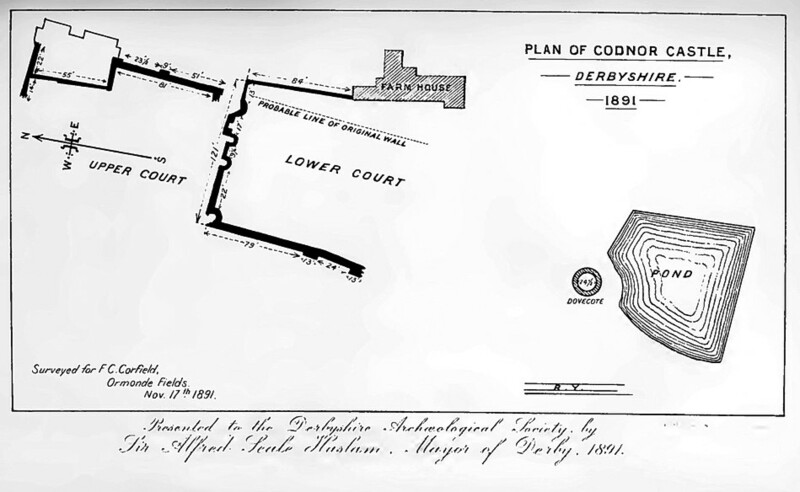 Journal 14 of the Derbyshire Archaeological & Natural History Society 1892 C.Kerry.